A Red. Hot. 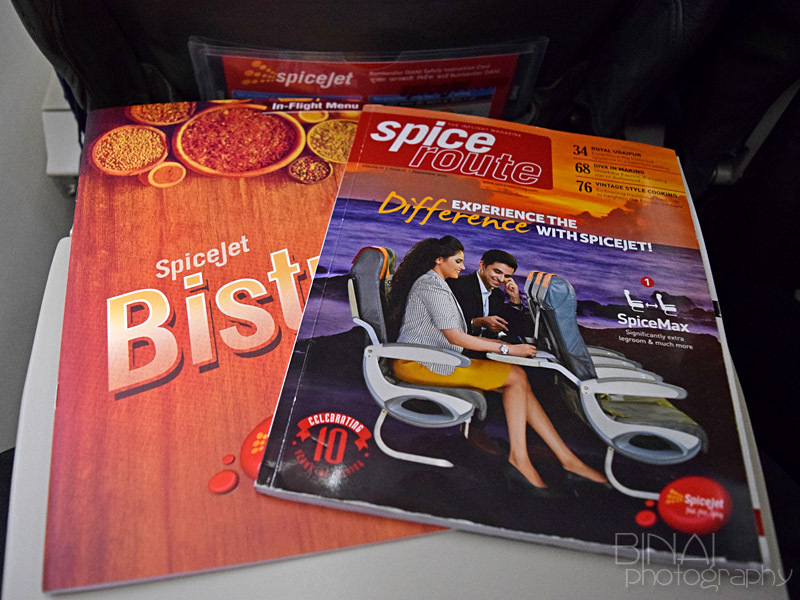 Spicy Dash from MAA to BLR! 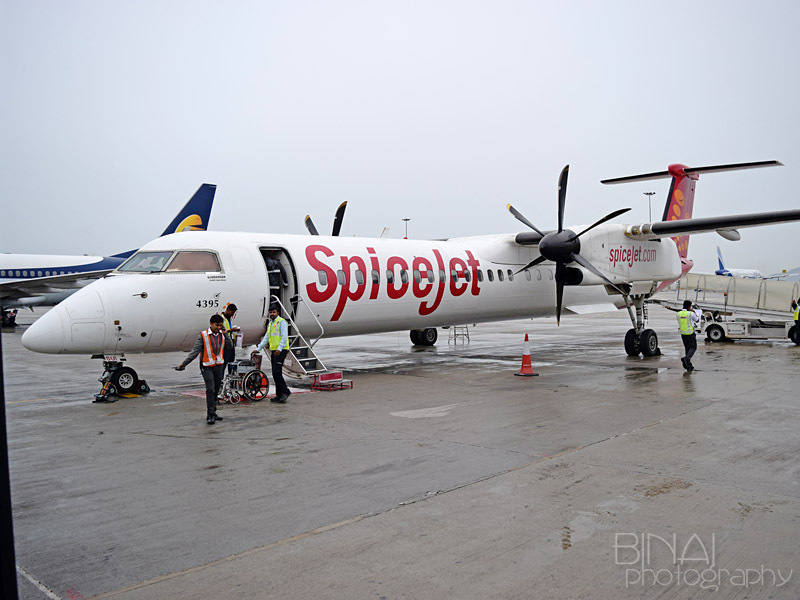 The Chennai-Bangalore sector is now dominated by turboprops! The sector sees as many as 8 ATRs from Jet Airways and 4 Dash Q400s by SpiceJet. The only 'bigger' aircrafts are 2x IndiGo (A320) and a 1x Air India (A320). Then there is a thrice weekly ATR from Air Pegasus as well. With my love for Turboprops, I could very easy narrow down by choices. Oh! Why did I say all this? I was looking for tickets to return from Chennai, after a two day outing there. 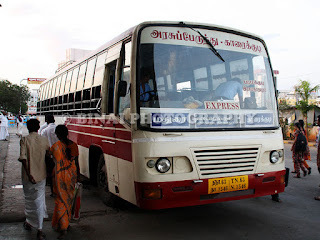 I initially toyed the idea of taking a bus - but the evening and night buses from Chennai were sold at a thousand rupees or more. I certainly do not like paying exorbitant prices for a short distance bus journey. 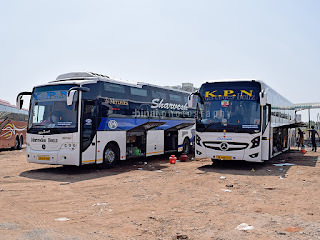 Soon after realising that taking a bus isn't really an option, I moved my search to my favorite OTA, Cleartrip. 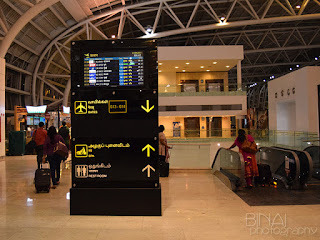 I found a couple of cheap options for Monday morning - a quick search was made on more OTAs to hunt for the cheapest fares for that flight, and I got the best fares from the website of my credit card issuer bank. 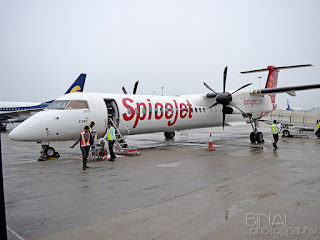 I quickly grabbed a seat for another flight in a Bombardier Dash-8 (Q400) operated by SpiceJet. I had a very early start to my day - I had booked a cab to pick me up from my hotel at 4AM, and I had to be ready by then. The cab was ready much before time, and we could actually leave from my hotel by 4AM. It was a fairly old vehicle, and the driver wasn't really amused when his phone showed that part of the payment for the ride was from my mobile wallet. I was at the airport by 0416hrs! 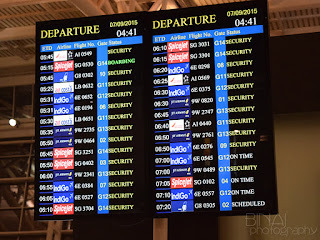 My flight would leave only at 0615hrs! I had almost two hours to kill. 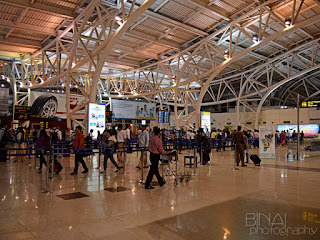 There was a very small queue to get into the airport - I then had a long walk to the SpiceJet check-in counters, which were at the extreme end of the terminal building. There was another queue for baggage scanning. This turned out to be a peak hour for the airport, with around 16 flights to depart before my flight, from the domestic terminal itself. I completed check-in by 0426hrs, and headed to security check. 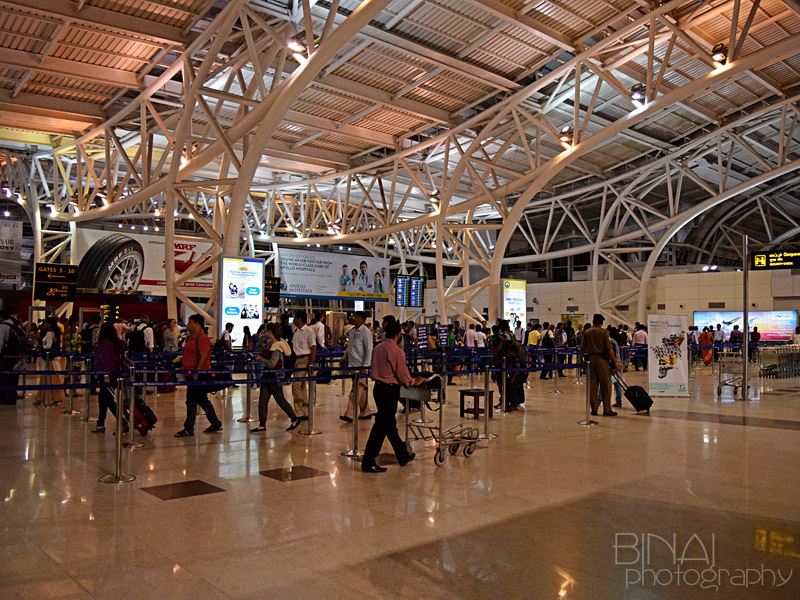 It was huge queue for security check - and even longer queue was seen for hand baggage scanning. The CISF guards were quite efficient, and they kept the queue moving fast. I was done with security check by 0441hrs. My flight was boarding from G14. 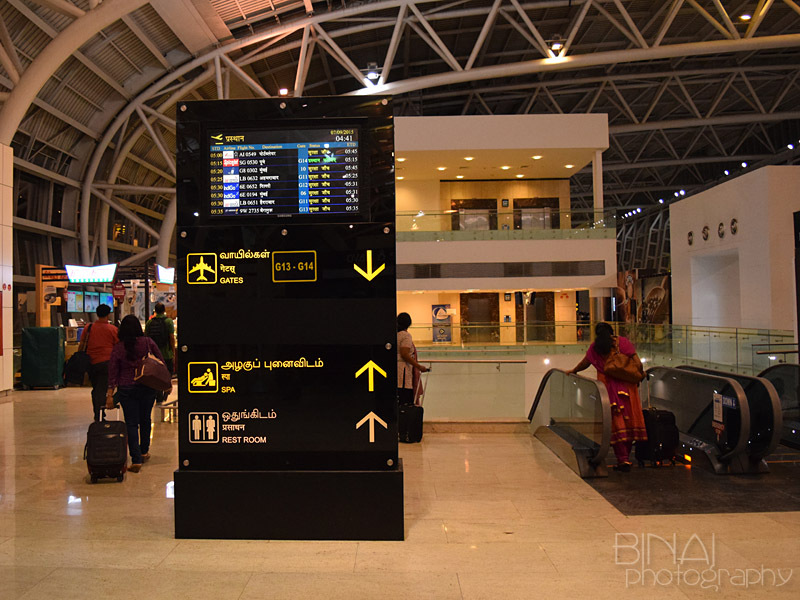 I first headed to my gate - I was quite shocked to see that it was a very small area, and there were no wash rooms or eateries in sight. I headed back to the upper level. The upper level is actually 2 floors higher than the bus gates. 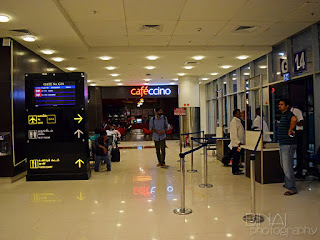 I had some light refreshment and a coffee from a very famous donut outlet located in the airport. The queue for Security Check..
Thats the huge list of departures! Taken at 0441hrs!! Once my tummy was happy, I was back at the gate, and found a seat near the gate itself. All through the time, the PA system was busy with one fight after the other being called. An airline very famous for bragging all the time kept making "last calls" for their passengers - infact, the lady at the mic made no less than 10 "last calls" for the same passenger in about 5 minutes time! 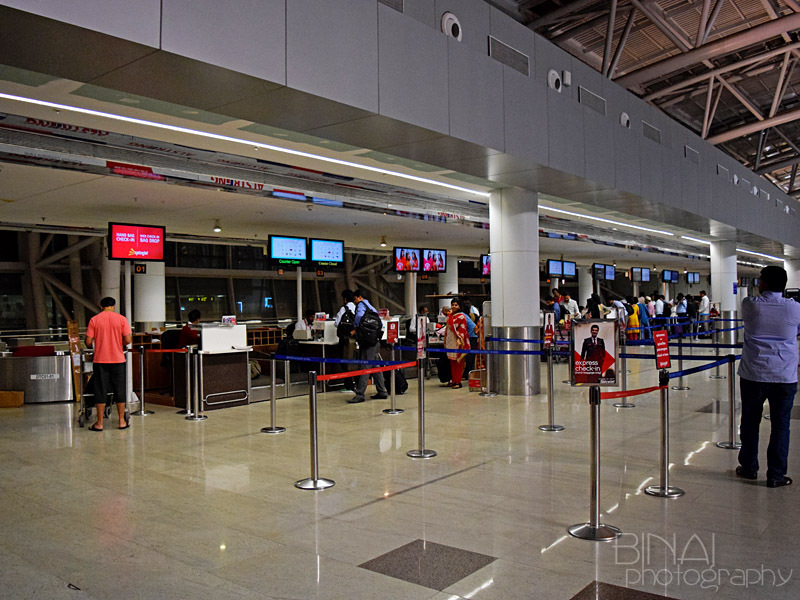 Imagine the state of poor passengers sitting at the terminal. Is it that difficult to just whip out their mobile phone and try calling the passenger on his/her registered phone number? As if it was some competition, the other airlines did not want to feel left behind - they started their share of "last calls". What left me bemused was that every single announcement was a "last call"!! Announcements kept pouring at the rate of about 1.5 calls per minute - and this continued all the time from about 0515 till my flight was called! 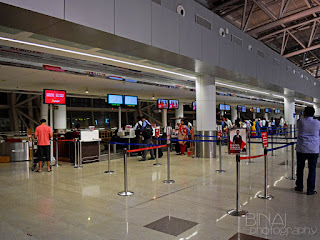 The gate - a few minutes before boarding was called.. It was a disappointing and disgusting experience sitting at the airport and being force fed with announcements. Gate #G14, from where my flight would board, was a busy place - my flight would be the 5th flight to board from that gate, from the time I reached there! Infact, the last 4 flights (including mine) were scheduled in a period of about 30 minutes! At one point, two flights were boarding from the same gate! 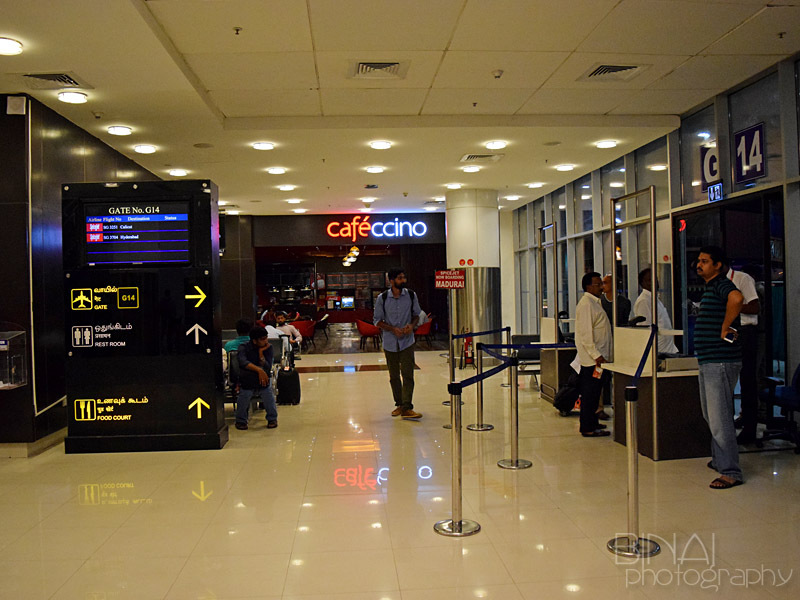 I decided to explore the surroundings of the gate a little before boarding called - it was then I discovered a full fledged cafe near the gate! There were no signage elsewhere (except at the gate)! Boarding for my flight was finally called at 0551hrs. Since two flights were boarding at the same time, from the same gate, a couple of agents checked my boarding pass to ensure I was getting into the correct bus. The bus got moving at 0555hrs - it was a very long ride to the stand (#54) where the bird for my flight was parked. 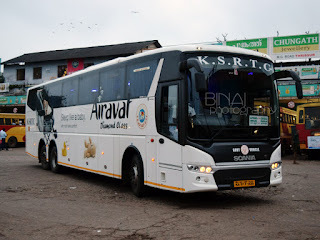 The bus reached the aircraft by around 0559 hrs - since ours was the first bus, boarding was confusion-free and orderly. I got into the aircraft at 0602hrs. The first thing that struck me was that the door height was less - I had to adjust a bit to get into the bird without hitting my head. 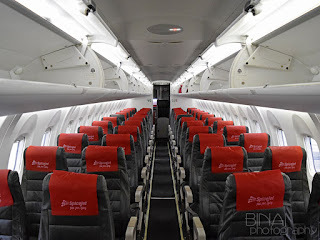 My seat was at the rear half of the aircraft (#17A) - the gangway felt very narrow. The seats were very comfortable, and the seat pitch was great as well. Although the seat pitch was good, the leg room for the passenger at the window seat is at premium due to the shape of the aircraft. In the meantime, boarding was completed (0608hrs). The doors were armed by 0613hrs, and we were good to go. The crew came on the PA system, and announced that our pushback would be slightly delayed due to congestion at the apron. In the meantime, safety demo was conducted. In the deck were Capt Nikhil Bora and Capt Shabir, while Rakesh and Prathibha took care of the cabin. We were finally pushed back at 0619hrs. The Pratt & Whitney PW150As came to life shortly after. We commenced taxi at 0623hrs, and headed straight to the holding point of Rwy25 (0629hrs). Taxi was very bouncy . 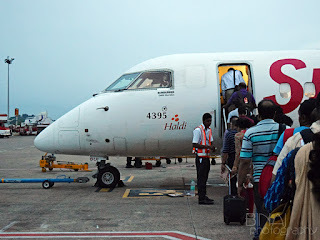 We were third in queue for take off - ahead of us was another SpiceJet Q400, and one IndiGo A320. We moved over to the active runway at 0636hrs, and held on for sometime. We were finally airborne at 0638hrs from Rwy25. After lifting off, we banked slightly towards north, then to the west, and finally aligned on the path towards Bengaluru. The climb was very quick - quite unlike the ATRs. Seatbelt signs were turned off at 0643 - soon after, the cabin crew sprung up from their seats and prepared to start the BoB service. I had prebooked a sandwich, and as promised, the cabin crew served guests with prebooked meals first. One of the crew came with the list and confirmed the order, while the other crew came with the sandwiches. Even then, my sandwich came after the captain announced that we'd be landing in about 15 minutes! 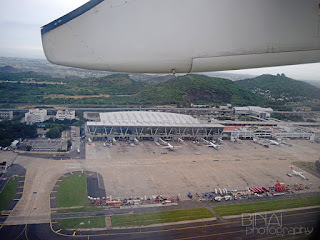 Lifting off from Chennai... Thats the domestic terminal in sight. Like the last time, it was again a Tomato, Cucumber and Cheese Sandwich. The sandwich was slightly high on Tomato - took me to the good old memories of the sandwiches my mom used to make at home. The sandwich felt a bit dry towards the end - and I had to hurry with it. Soon after I received the sandwich, the seat belt signs came back on (0658hrs). I wanted a serving of water to wash down the sandwich - the FA attended to my call quickly, and with a very warm smile. 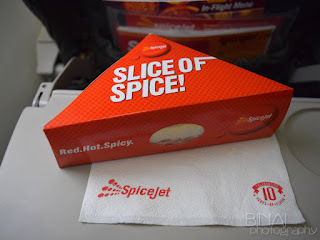 I somehow like this aspect of SpiceJet - even at the peak of their turmoil last year, the FAs served with a very nice smile. They had to hurry about preparing the cabin for landing - collection of thrash, ensuring that the tray tables were shut and the windows were open. 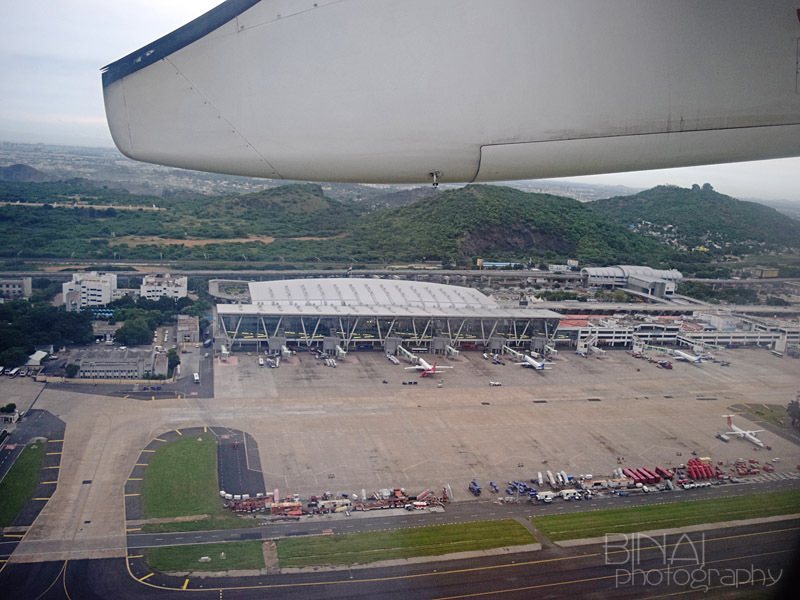 We finally touched down on Rwy27 at 0715 - we had the usual long taxi to the parking stand. We finally parked at 0719. The touchdown moment - the runway was wet - so its a lot of water there. I remained seated till all the other passengers got off - I wanted to take a couple of pics. I succeeded in that, and hurried to the bus which was waiting for me to get on board. We were dropped at the terminal at 0729hrs - after a long ride from the stand till the other end of the apron, and then turn around and travel half the earlier distance to drop us at the gate. My bag came out very soon - this happens to be a fairly regular incidence for me these days. I was out of the airport by around 0735hrs. 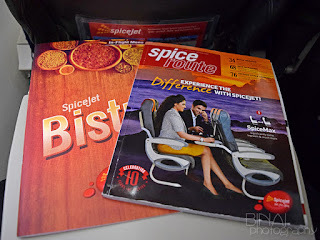 Summary: Another great flight with SpiceJet - this was perfectly one time as well (a 5-10 minute delay is acceptable, IMO). Great crew again. Good food as well. I liked the Q400 ride this time - except that the aircraft is really bouncy when it taxi'd. It climbed very fast compared to an ATR. 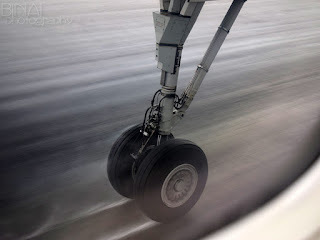 The aircraft was noisier than an ATR, IMO - it produced more vibrations as well. But it was faster. 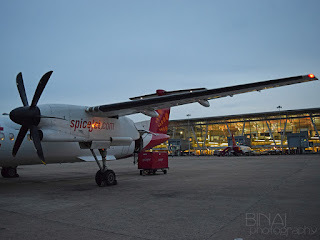 I look forward to fly with SpiceJet, and the Q400 again. On the smiling Plane 114 - BLR to Chennai!